Powerflo Products Inc. rebuilds all pumps including this GASO reciprocating type pump. The pump’s serial number dates back to World War II era and is still worth the rebuild! Our inspection found oiling inefficiencies that lead to premature pinion shaft and pinion shaft bearing wear, however the crank shaft journals were still in new factory specs, amazing! Following the rebuild our sales engineer over saw the pump’s installation and successful start-up. With it’s all new power end and liquid end wear and tear items and an updated internal oiling system this pump will provide the customer with decades more of dependable pumping service. All major brands serviced such as Aplex, Myers, Gaso, National, Wheatley, Gardner Denver, FMC Bean , Kerr and more. 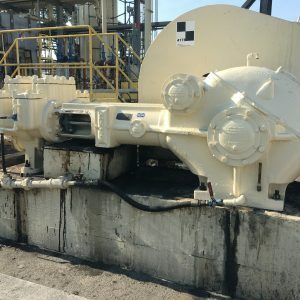 Facilities such as pulp and paper mills, oil refineries, oil production fields, waste water treatment, food, beverage, and general industrial manufacturing plants partner with Powerflo Products Inc. for fast, efficient, and reliable repairs to their rotating and processing equipment.